On the third weekend of most months, our bank pulls out all the stops to entice clients to use their debit (or sometimes credit) cards. We happily oblige because the savings are substantial. 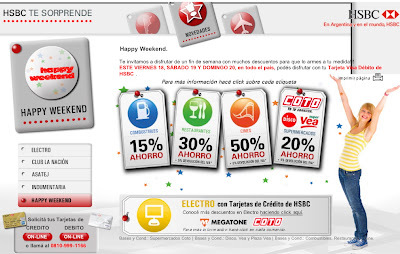 "Happy Weekend" (yep, that's the term, no translation needed) offers discounts of 20% on purchases at certain supermarkets, 30% on restaurants (up to 50 pesos per day per account), and 50% on movie tickets. Happy Weekend has become routine for us; around it we plan major grocery shopping expeditions for nonperishables and staples as well as culinary excursions to old haunts or new favorites. This past weekend we headed to the Coto (the big supermarket in the neighborhood that partners with the bank) on Friday for staples and then again on Sunday for fresh meat and other items. Supermarket savings both days: 108 pesos. We managed two cafés on Friday, first La Biela, the iconic lunch spot right across from the Recoleta Cemetary, for a shared lunch of toasted ham & cheese sandwich (an Argentine staple) with fries, and then Piola, our latest favorite pizza place, on Libertad near 9 de Julio. Saturday featured dinner with friends at Caseros on the border of San Telmo and Barracas, for the first but not the last time. Sunday dinner was three blocks from the apartment at Los Pinos, our favorite neighborhood steak spot. Restaurant savings: 139 pesos. Total savings: 247 pesos, or about $62 USD. 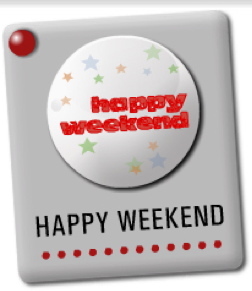 It was a happy weekend.